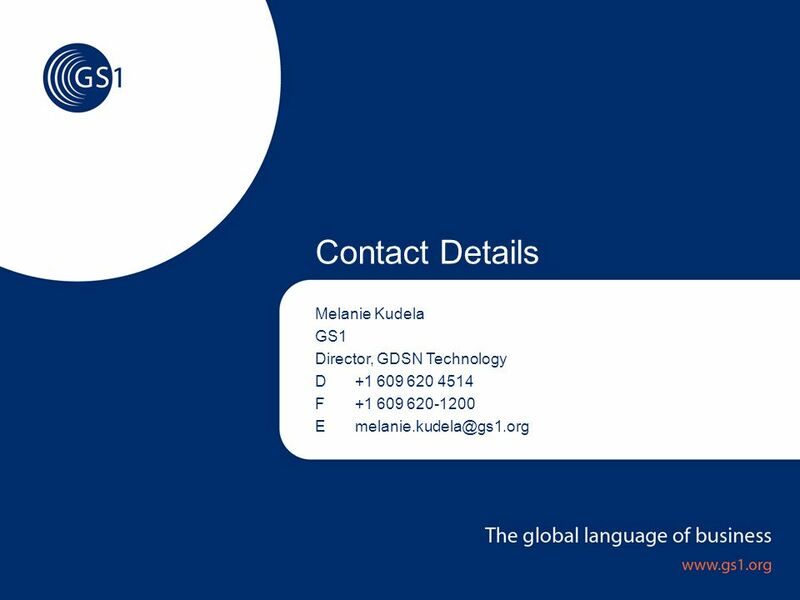 GSMP Local Community Network Global Agenda 22 Jan 2009 Melanie Kudela. 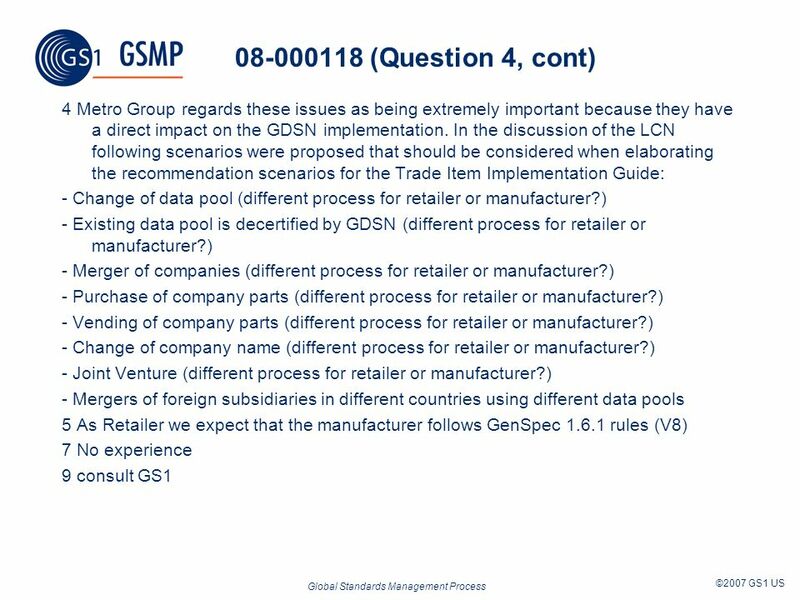 4 Global Standards Management Process ©2007 GS1 US No CR# – Reconnaissance Type Question on GDSN Price Sync Implementation – Question 1 From GS1 Australia 1) Which Data Recipients (on which Data Pools) are generating the priceSynchronisationConfirmation message to enable continuing price synchronization? Note: this excludes any data pool functionality to default these responses on behalf of Data Recipients. 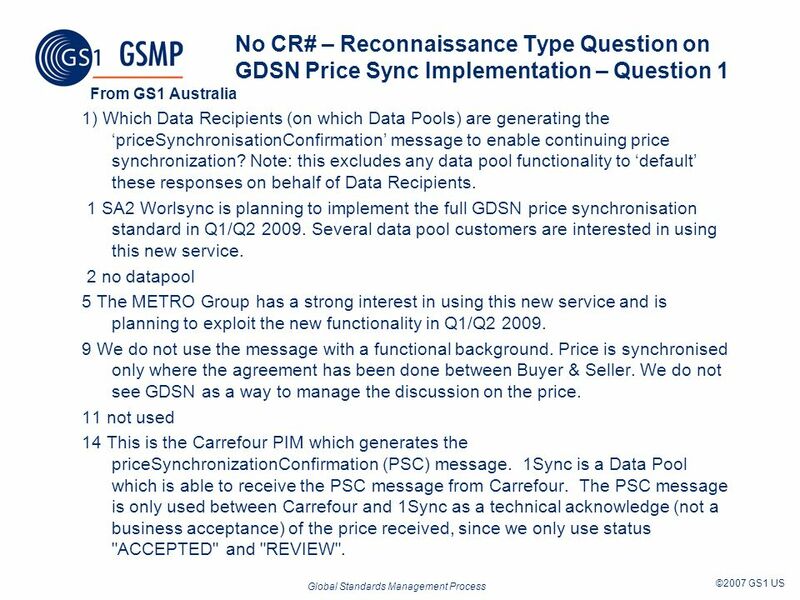 1 SA2 Worlsync is planning to implement the full GDSN price synchronisation standard in Q1/Q2 2009. Several data pool customers are interested in using this new service. 2 no datapool 5 The METRO Group has a strong interest in using this new service and is planning to exploit the new functionality in Q1/Q2 2009. 9 We do not use the message with a functional background. Price is synchronised only where the agreement has been done between Buyer & Seller. 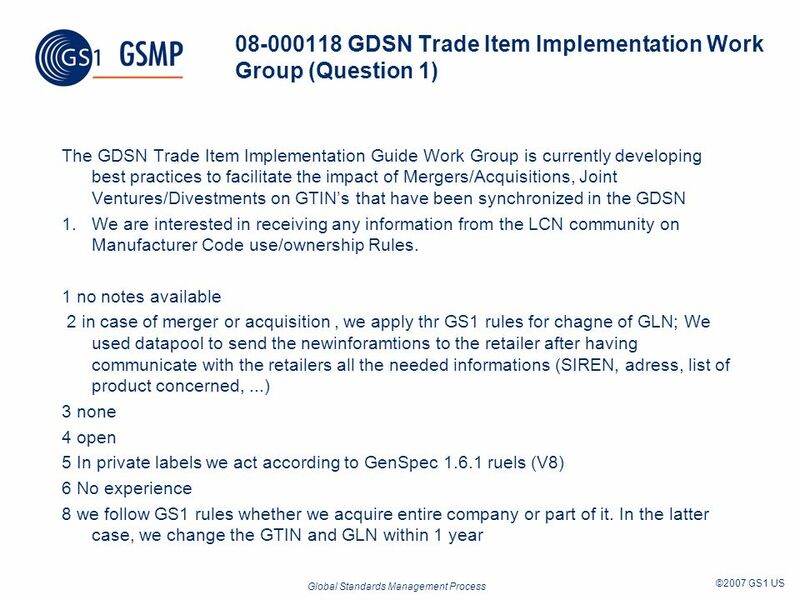 We do not see GDSN as a way to manage the discussion on the price. 11 not used 14 This is the Carrefour PIM which generates the priceSynchronizationConfirmation (PSC) message. 1Sync is a Data Pool which is able to receive the PSC message from Carrefour. The PSC message is only used between Carrefour and 1Sync as a technical acknowledge (not a business acceptance) of the price received, since we only use status "ACCEPTED" and "REVIEW". 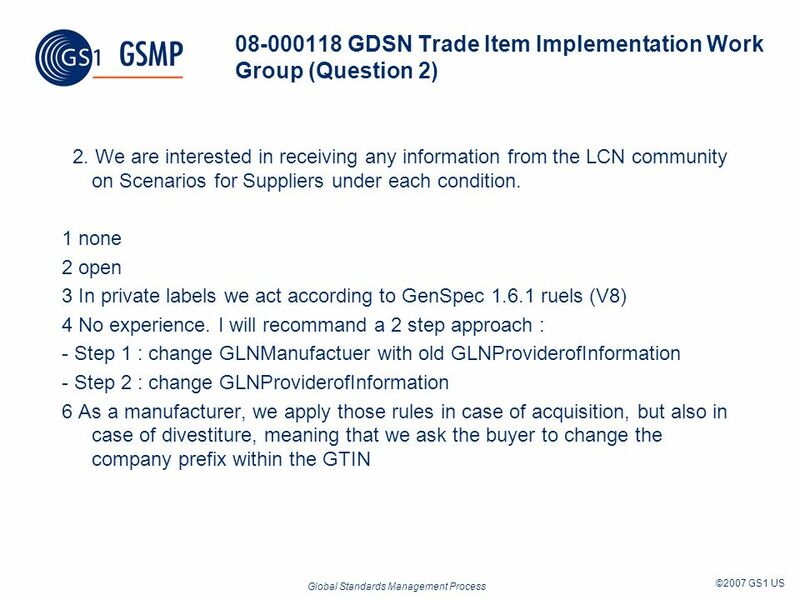 5 Global Standards Management Process ©2007 GS1 US No CR# – Reconnaissance Type Question on GDSN Price Sync Implementation – Question 2 2) Would such Data Recipients or Data Pools have any implementation experience or best practice they could share, in this area? 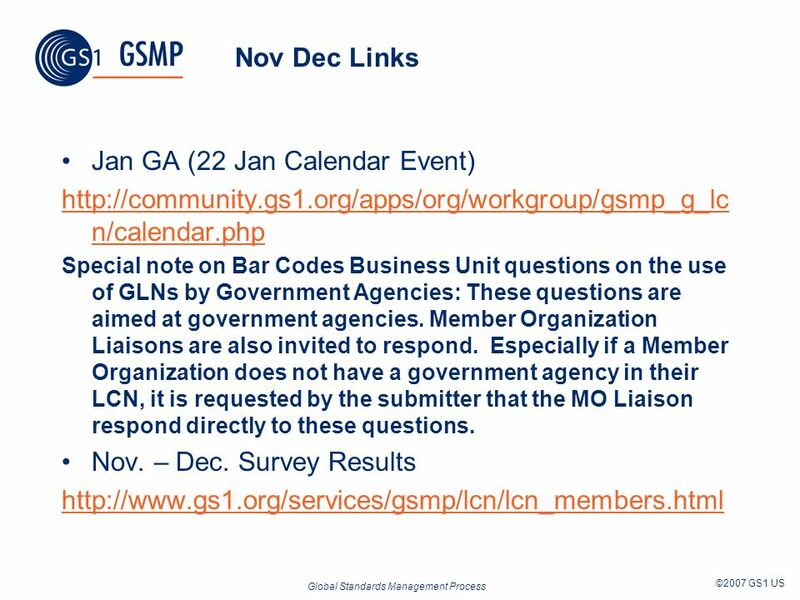 1 we don't have any guideline 2 no 3 none 4 open 5 METRO Group has participated in a pricing pilot project. The results of gained experiences were integrated in the pricing standard and could serve as a basis for further implementation. 8 not used 9 Carrefour processes as following with 1Sync : When a PriceSync Document (PSD) is sent by 1Sync to Carrefour, 1Sync auto-accept it in its system (status generated automatically on "ACCEPTED"). 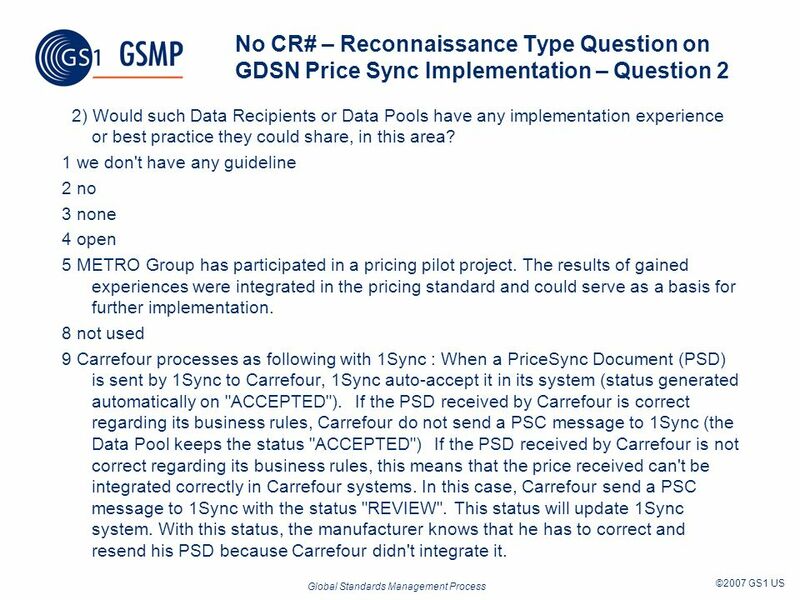 If the PSD received by Carrefour is correct regarding its business rules, Carrefour do not send a PSC message to 1Sync (the Data Pool keeps the status "ACCEPTED") If the PSD received by Carrefour is not correct regarding its business rules, this means that the price received can't be integrated correctly in Carrefour systems. In this case, Carrefour send a PSC message to 1Sync with the status "REVIEW". This status will update 1Sync system. With this status, the manufacturer knows that he has to correct and resend his PSD because Carrefour didn't integrate it. 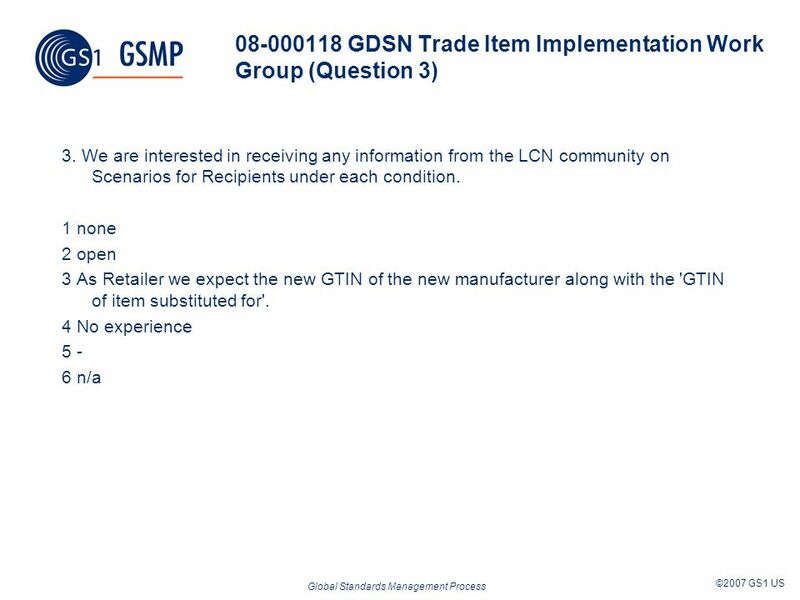 9 Global Standards Management Process ©2007 GS1 US 08-000118 GDSN Trade Item Implementation Work Group (Question 4) 4. 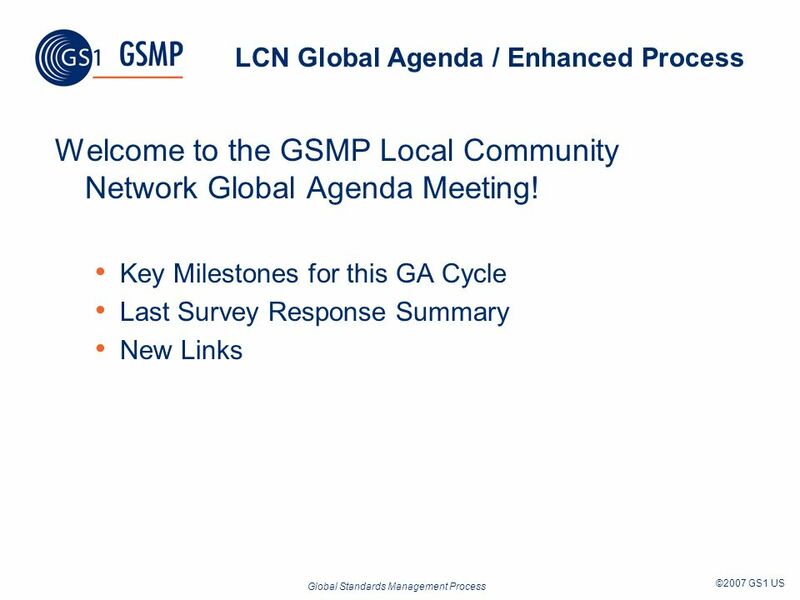 We are interested in receiving any information from the LCN community on general advice for Data Pools. 1 The data pool are used only to confirm the new information, not to communicate for the first time the announce of change in case of merge/acquisitions. 2 The work of this CR is extremely important. Following scenarios should be considered when developing recommendations: - Change of data pool (different process for retailer or manufacturer?) 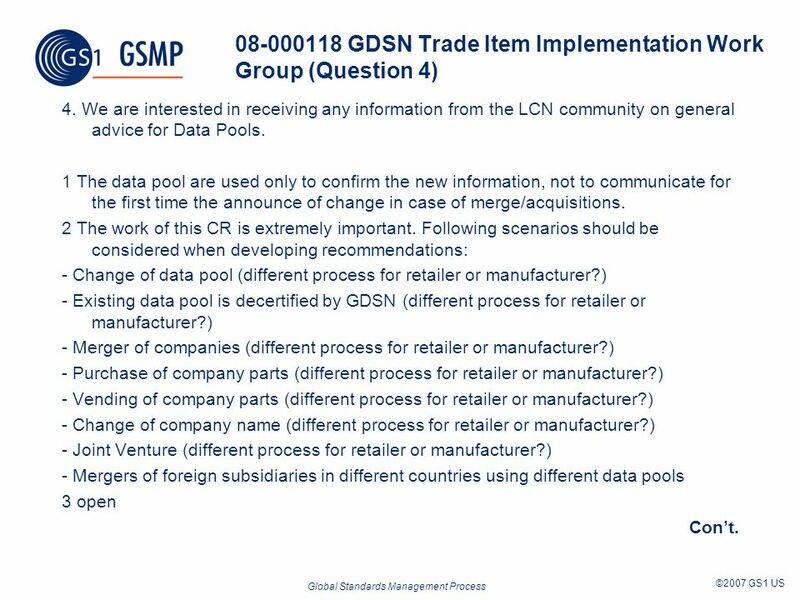 - Existing data pool is decertified by GDSN (different process for retailer or manufacturer?) - Merger of companies (different process for retailer or manufacturer?) - Purchase of company parts (different process for retailer or manufacturer?) - Vending of company parts (different process for retailer or manufacturer?) - Change of company name (different process for retailer or manufacturer?) - Joint Venture (different process for retailer or manufacturer?) - Mergers of foreign subsidiaries in different countries using different data pools 3 open Cont. 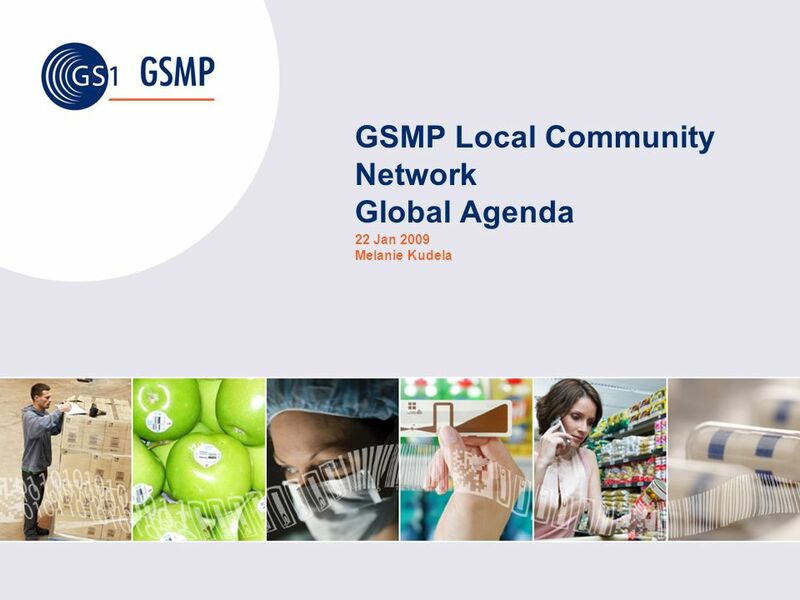 Download ppt "GSMP Local Community Network Global Agenda 22 Jan 2009 Melanie Kudela." Data Pool Business Procedure Preparation 12 October 2005 Peter J. Alvarez. Hungarian Solution Provider Programme February 26th, 2010 Brussels. 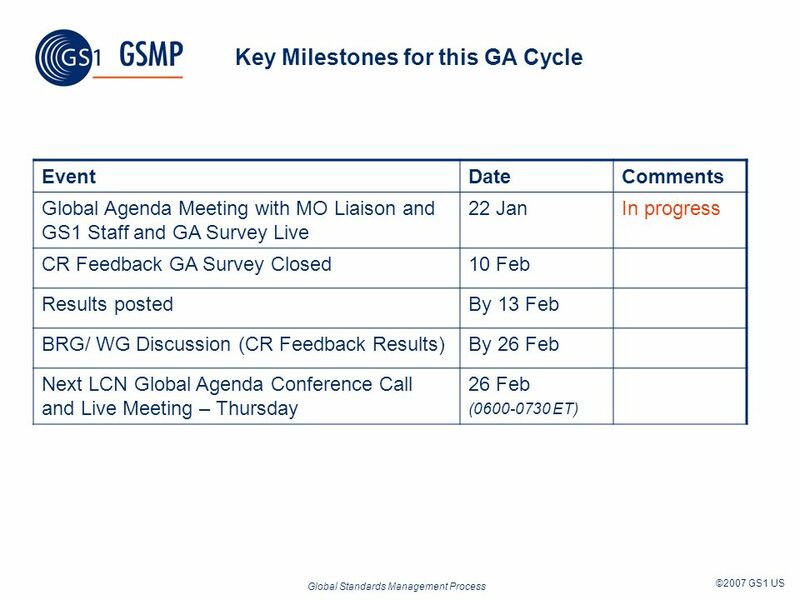 New GSMP Governance Proposal (This recommendation provides the governance approach for the standards development only) ISDP Governance Team 2-September-2009. Mobile Com Extended Packaging GSMP Lunch and Learn 06 October, 2008. GSMP Local Community Network Global Agenda 3 Dec2008 Melanie Kudela.